Canning Applesauce- Super Easy Homemade Applesauce! 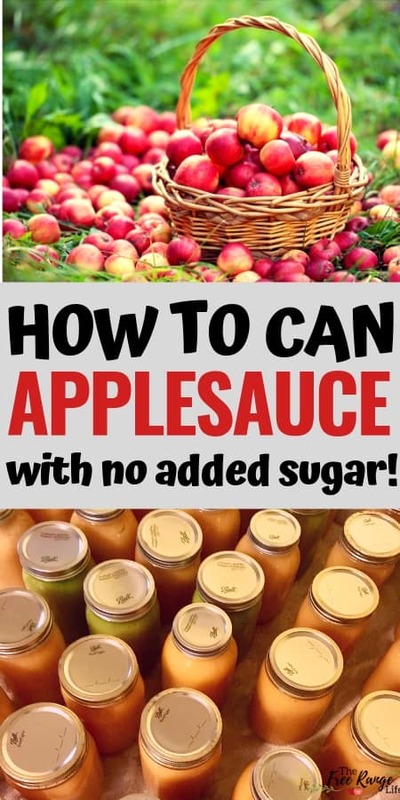 In this Post: Learn how to make homemade applesauce- with no added sugar! Also includes instructions for canning applesauce in a water bath canner. I have fond memories of “applesauce day” growing up. We’d bring home bushels of apples and spend the day cutting and cooking and straining the apples. In the end we had dozens and dozens of quarts of applesauce up on the pantry shelf. 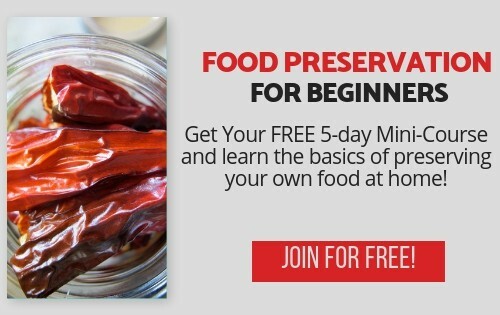 Plus canning applesauce is one of the easiest things to preserve at home! 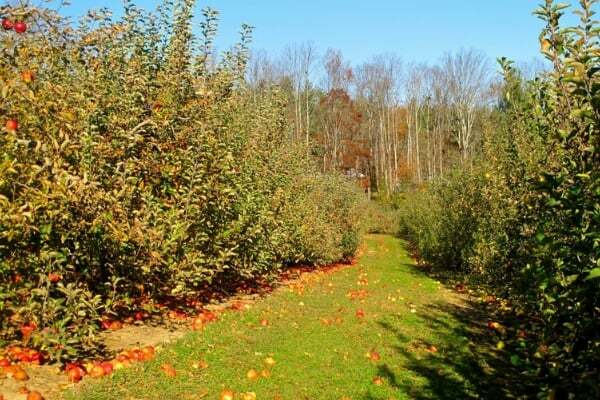 Now, we are lucky to live about 30 minutes away from Hendersonville, NC- the home of dozens and dozens of apple orchards! 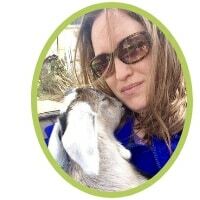 Most of those orchards are closing up shop for the season, but a few still have a lot of fruit on the trees or boxes of great-for-applesauce dropped or bruised fruits for quite a deal. We stopped by one of these local orchards last weekend, and picked up a bushel of “seconds” for less than $10 and we picked 3 bushels off the trees. We just walked down the rows and rows of trees picking some of each type- Cameo, Mutsu, Fugi, Pink Lady, Jonagold and a couple more. That’s the key to a really good homemade applesauce- combining a lot of different types. Each variety of apple brings it’s own flavor, and they all combine to make one amazing sauce- with absolutely no sugar needed. that is over 30 years old, the same one my parents used on the homestead where I was born. It makes the process a breeze, and the kids love using it. Which means I can hand over that job to them, while I man the hot stove. Once you’ve gathered your varieties, your first step is to wash them. My youngest 2 kids did this job since they weren’t quite as helpful in the cutting department. 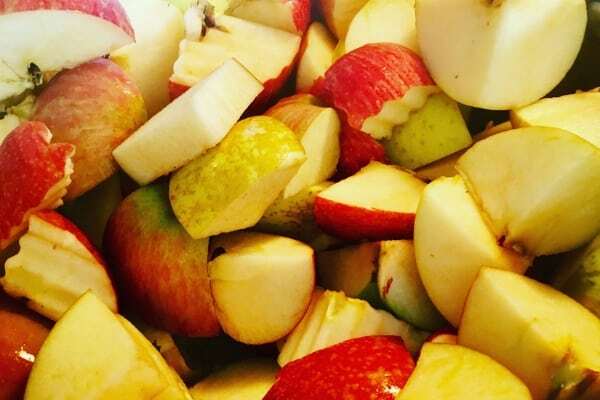 Each bushel of apples will give you somewhere around 12 quarts of sauce. So make sure you have enough jars, lids and bands clean and sterilized before you begin. I usually just fill the dishwasher with jars and run a short cycle just before we begin and they are ready to use by the time I need them. 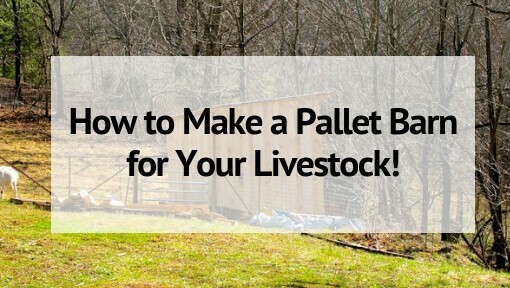 This is also a good time to gather the rest of your supplies. 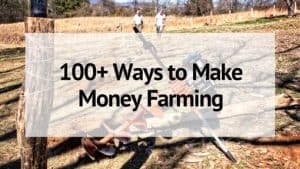 You will need a large pot for cooking apples, knives and cutting boards, an assortment of bowls/pots for catching applesauce and waste as it comes out of the strainer, and a couple good spoons for stirring and scraping the sauce as it comes out. Don’t forget your canning supplies too! 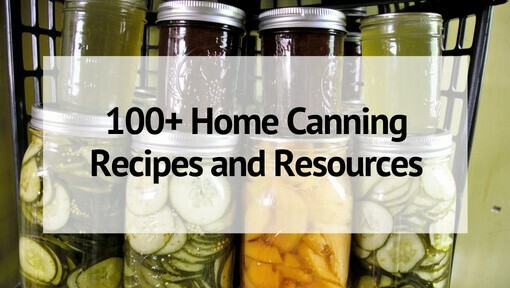 Related Reading: 11 Food Preservation Guides That’ll Turn You into a Canning Genius! Once your apples are clean it is time to start cutting! With a food strainer you don’t have to remove the skins or cores- just cut each apple in half and then quarter each half. If you’ve got older kids, they can definitely help with this part too. Don’t be shy about delegating the responsibilities and making it a family day! Throw the apple pieces in a large pot with about a quart of water, or apple cider, and cover and allow them to steam until they are soft. While they are cooking, set up your food strainer nearby. Growing up we did this in the garage, but now we set it up in the playroom, since I figured the chickens would be in the way if we did it outdoors! Once the apples are soft, carefully transfer them to a large bowl using a slotted spoon. Pour the apples into the strainer’s spout and start cranking! Don’t forget to have a bowl in place before you pour in the apples! I loved this part as a kid, and mine did as well. One would crank, one would scrape and one would mash the apples down into the strainer! 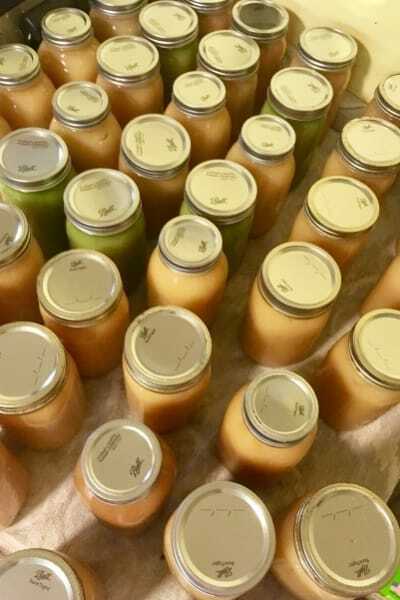 Keep the applesauce warm and repeat this process over and over until you have enough applesauce to fill the 7 jars that fit in your canner. Fill the jars with applesauce, leaving a 1/2 inch head space. Wipe the rims of the jars and top with prepared rings and bands (Do not over tighten the bands). Place them in your boiling-water-bath canner and process for 20 minutes, for quarts. Allow the jars to cool undisturbed and check for a proper seal once they are cool. For more in-depth information on canning see my post on How to Can Peaches. Keep repeating this process until you have processed all of your apples into amazing home-canned applesauce! I think it is perfect made out of only apples, but feel free to stir in some cinnamon or throw in some berries for a strawberry, blueberry or blackberry applesauce blend. And definitely don’t forget to try some straight out of the strainer! Nothing quite compares to fresh, warm, homemade applesauce! Have you ever made your own applesauce? If not, I hope you’ll try it and let me know how it goes! I made applesauce for the first time this year….borrowed a squeezo. which screen do you use? The first batch I used the coarsest, the 2nd time I used it used the medium. They’re each quite a pain to clean. I am not sure of the size of our screen. It’s a really old squeezo and we only have one screen. It’s pretty small, the same one I use to make tomato sauce with. Looking at their website, it’s probably the tomato screen. This is exactly how we do it. I have a Roma strainer, and won’t make applesauce any other way now that I use that. I soooo agree about eating some right out of the strainer…oh yum! The kids love helping with the applesauce cranking, just like the little boys in your photo. Fun times! I make my applesauce in a large crock pot. I do core and peel them, but it’s not too bad if you use one of those round hand held apple corers. 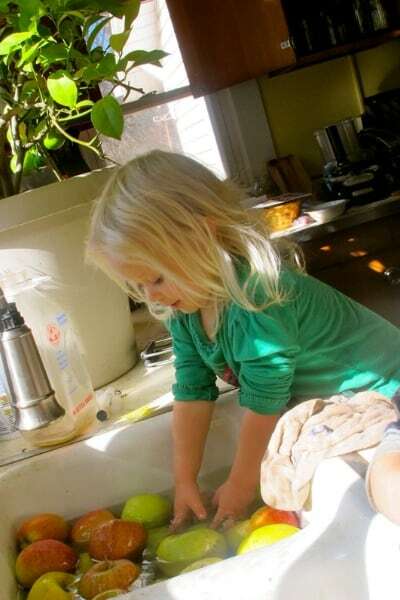 You will end up with apples slices, and then I cut the peels off the slices. Next, cut each slice into 2 or 3 bite sized pieces. Put the apple pieces into your crock pot. I add about a tablespoon of cinnamon, and a teaspoon of pumpkin pie spice. In a couple of hours your home will smell amazing! I used to start it in the morning, set on low, and when I came home from work……mmmmmmmm. It takes about 3 hours on high- just use a fork and smash the chunks. Yummy! Oh- no need to add any water or sugar. Just the apples and optional spices. I think I am missing something here – I thought you had to have sugar or something to “preserve” the ingredients. I would love to can sugar free apple sauce but I did not think it was possible. No sugar or preservatives needed. The canning process creates a seal that’s what preserves it in the jar. I was wondering about the water bath. Are the jars covered completely or partially by the water? And if partially, about how far up the jar should the water go? Thanks. I’ve never canned before.